I had high hopes for this book, and while I enjoyed it, I didn't love it as much as I wanted to. I know a lot of people are complaining about the fact that this was built on a common YA Fantasy premise (main character gets into some sort of tournament that requires them to kill other people/fight for their life), but that didn't bother me. I knew what I was getting myself into because the blurb is honest about this part, and I'm not one to complain about tropes. The problem with Mask of Shadows was how it didn't do much with that trope. There was an overall lack of something special or intriguing enough to make this stand out. Even if it relied in a common premise, it could've still given me incredible frienships, amazing chemistry, swoony romance, memorable characters, enganging action scenes or explosions. Everybody likes explosions, right? But I couldn't find any of that. Sure, there was a nice friendship between Sal and Maud, the girl appointed by the court to serve Sal while she was in the running to becoming (not America's Next Top Model) Opal, one of the Queen's personal assassins. But it was just that. Nice. It took Sal too long to see Maud as a friendly figure. Then once they did, it felt like the book was ending and there were tons of other things happening. The chemistry/romance was also lacking. I was excited when Sal first met Elise while trying to rob her--who doesn't love that? But as they met again when Sal was already in the competition, I didn't feel the connection between them as much. They had some flirty and cute moments, but they never pulled me in completely. As to memorable characters, that's where Mask of Shadows came closer to hooking me. I liked Sal. I'd initially forgotten all about Sal being gender fluid (I got the e-ARC a while ago and was waiting to read it closer to release date), and I ended up playing a game of is this narrator a girl or a boy for a few pages, which was fun. Then the explanation came and I was pleased to see how respectful it was. I won't pretend to know much about the subject, but I understood what it meant for Sal to be gender fluid and how that was part of their life, so I'm counting that as a win. I also liked how other characters, like Ruby, respected that and made sure to address Sal properly. Speaking of Ruby, I have to say he was my favorite character. I don't know exactly what it was about him that intrigued me so much, but there was something special about that character. There were no explosions (that I remember), but there were actions scenes and they were good enough. "Only difference between robbery and murder was what you stole." I also have to give props to the author for the world she created. I liked the masks, shadows and nations, and I might be wrong here, but was there a Portuguese vibe to it? At least the names made me think of Portugal and even Brazil. 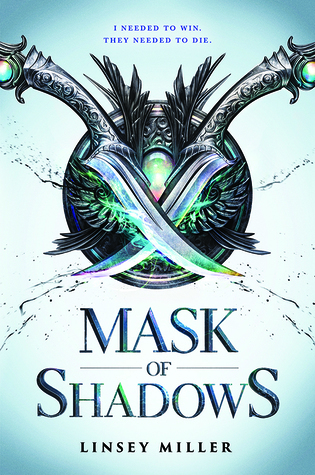 Overall, Masks of Shadow brought some interesting elements to a common YA Fantasy premise, but it didn't wow me.